I got my first (and only so far!) new car when I was 27. I'd like to say that I saved up and purchased it with cash, but in reality our second household car gave up the ghost right at a time when I had recently been promoted after years of struggling along to pay the mortgage while waiting for our big break. So we financed it. We hadn't had much luck with cars before that. One after the other would break down, have power windows be permanently stuck unwound, gear box failures, everything seemed to happen. I even remember spending a few weeks with my driver side mirror sticky taped onto the car, which needed redoing every trip to make it stick. After spending thousands over the years fixing some shocking used cars, we decided it was definitely time for a new car. The first time I climbed in to my new car was so exciting. The new car smell, the clean interior, the perfect handling, it's intoxicating. It was also the first car purchased for me. Every other car had been a hand me down from my sister, my mother or my husband. Good cars that served their purpose, but not ones that I got to shop for and choose as my favourite. Years later and we are always looking out now for our next car. We have long since outgrown our 5 seater medium sedan, and it's time to start considering something bigger. If you are planning on buying a new car, there isn't a better time than now. The Volvo End of Financial Year sale is on, and now is the best time to pick up a new car with lower prices available and sales men all ready to bargain. Before you head out on the hunt for a new car, here are my tips for making sure you walk away with the best price. Visit multiple dealerships and explore their offers before you make a decision. Each dealer will have their own approach to customers and by the time you have spoken to two or three you will have a very good idea about the best price you can get and the options available. Consider how the model you are choosing is going to fit your family over the next 5-7 years. This is a major purchase, and your circumstances will change. Is it possible you need a car with more car seat hooks? More leg room for teens? Do some research on the costs of optional accessories and the insurance implications. Often if they are not standard, or not fitted by the dealer, they cost extra to insure or are excluded from your policy. Weigh up these costs when deciding whether to have them fitted as standard. Take your quotes to your closest dealer and ask them to beat it. 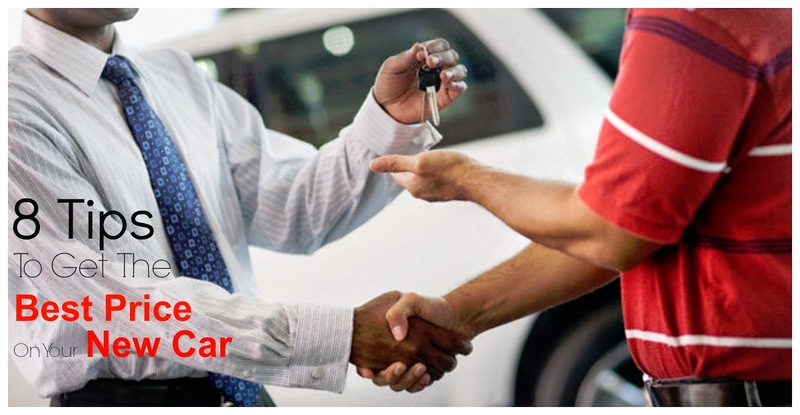 New car salesman are in a commission based role, they want your business and will look after you if you ask nicely! Choose the last weekend of the month to complete the sale. If your salesman is trying to meet a quota, giving you a bigger discount to secure the deal could be in his best interests! But make sure you did your leg work first heading into the dealers much earlier to go for a test drive and source your quotes. Once the sale is locked down and the price is set, ask again what your salesman can do for you. Road side service, upgrades, accessories, you never know what can be thrown in for the asking. If you are financing your car, talk to your financier about whether they have any group buying discounts. We gave our financier what we thought was the best price, and they organised a further $800 discount for us from the same dealer! Research your insurance costs before you walk into the dealer. Making a hasty decision on the insurance provider at the last minute could leave you hundreds of dollars out of pocket. Lastly, one of my favourite things about visiting my dealer is the coffee. The very best dealers have a terrific coffee machine in the customer waiting area. If you have visited the dealer and haven't gotten a great coffee out of the experience you've done something wrong. Do you have a terrific tip to share on getting the best price on a new car? This post on getting the best price on a new car is partnered with the Volvo End of Financial Year Sale. Now is the best time to get into your local dealership and start negotiating for your best price. I have owned a car from new. I worked hard to save up for some of the cost and paid the rest off. It was so lovely knowing that I was the only person who'd driven it. Great tips (especially the coffee tip). hehe. What a great blog you have! I've never been here before but will definitely be back. I LOVE my car because it's the first one I've had that hasn't been wrecked by my kids, what with them all having their own now. It's almost two years old now but in pristine condition. Only ever driven by a little old lady! I love the new car smell its sooo nice. My current car was bought new but for my ex husband because he totalled my car and his broke down so the deal was we get a new car for him to drive and I got to catch the bus (yea he really was that much of a nice guy o.O)... anyway I inherited it in the divorce so yay.